2013 is just about on the edge and it’s almost time we do a quick round-up for the cool gadgets we have enjoyed over the year. There have been a number of gadgets by several top notch manufacturers trying to get a break through in the market and be the best gadget for 2013. Here’s a list of top 10 best gadgets for 2013 that made it to our list. 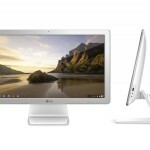 The recent addition to the AIO desktop computer world by LG features Chrome OS. Although through this article, we have tried to list as much known specs and features of the new LG all-in-one Chromebase, yet there’s less excitement when compared to our review for Apple’s iMac.